Mike Hardister, a lifelong resident of Sonoma, is by trade a carpenter and for the last 20 years the owner of a local business, MH Excavating. In 2004 he rekindled his love of woodworking. While visiting a ranch in Petaluma, California, Mike spotted an old wagon from the early 1900's perched on a pair of saw horses. The rancher said, "I've been wanting to get rid of that old thing for some time". Thats all it took for Mikes creativity to begin to flow. "I could make a bed out of this beautiful relic of the past," he thought. Soon Mike and his wife, local leather designer Lou Ann Hardister, headed out with flat bed in tow to pick up the prize. Friends and neighbors scoffed at the idea but it didnt stop Mike, he had a vision. Soon he was in his workshop working away, spending every spare moment he had on this bed. Since then Mike has created three beds, each one an original. 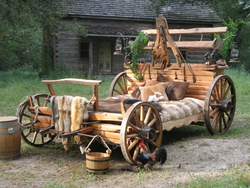 Each bed comes with its own "Certificate of Origin" telling the history of the wagon; where it originated, what it hauled, who owned it, what was the name of the ranch it was hauled from and what kind of draft horses pulled this historic treasure that "Won the West." Mike does not destroy a useable wagon. He resurrects a wagon that has long been forgotten. The wood has deteriorated beyond repair, exposing the "bones" of hand-forged metal now rusted to a beautiful patina. Neil Shepard, a local wheelwright, heir to the famed Jack London of Glen Ellen, California, recreates the spokes and wooden rims out of new oak and fires them the old fashioned way. Mike always tries to salvage the old metal tire and the hub, which is fingerprinted to the axel. The original wagon pieces are then planed and shaped out of the beams of 70-100 year old barn wood. Each piece of wood is selected to become a queen or a King size bed. These fir beams, when planed to the heart, begin to reveal their beautiful golden hue. This only happens with aged wood. The bed is designed to roll away from the wall revealing a storage compartment featuring a linen closet, gun rack and wine holder. "MH," as most Sonomans call him, then adds the finishing touches; a couple of antique lanterns and a buckboard. His signature piece is an old rusted cowboy that adorns the headboard. He then spends many hours waxing and buffing until the finish is smooth to the touch. Each bed may take up to 450-500 hours to complete. Mike's wife Lou Ann dresses the bed in a fur bedspread, hair-on calf pillows, steer and buffalo hides. See her leather creations on her own website, Chic Skins fine western wear. 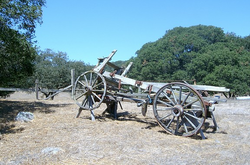 Jack London's wagon from "The Valley of the Moon" in Glen Ellen, California. A sturdy old lumber wagon, with a brass license plate engraved - "SF 1906 -$2.50" - thought to have been used to rebuild San Francisco after the 1906 earthquake. This special 100 year old bed made its debut in September, 2006, at the Western Design Conference in Cody, Wyoming. An 1880 wagon, found abandoned on the Carriger Ranch with a tree growing through the middle of it. The Carrigers traveled west with the famed Donner Party, from whom they parted ways in Utah when the weather turned bad. The Carrigers made it through before the storm hit. The Donners got caught on the Summit - you know what happened next. The Carrigers came to Sonoma and acquired land from General Vallejo. An authentic Studebaker freight wagon that dates back to 1840 was used in the wagon trains for the Westward migration to supply the rapidly growing Golden State of California. It was specifically used to haul heavy barrels, gold mining equipment and furniture. The Mayhood Family of Cordelia Junction acquired the wagon and used it to haul hay for over 75 years.